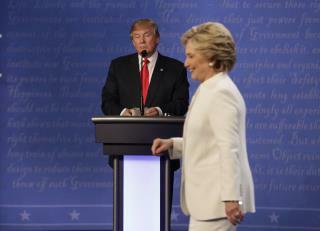 Both candidates turned in their best performance of the three debates, according to Chris Cillizza at the Washington Post, who declares Clinton the winner. "She finally figured out the right calibration of ignoring and engaging Trump," he writes, while Trump's answer on accepting election results "was a total disaster and will be the only thing people are talking about coming out of the debate." For a few minutes early on, "we had something like a normal debate," with candidates setting out familiar policy positions, writes Arthur C. Brooks at the New York Times. But as the evening went on, "concrete solutions mostly disappeared and the tone became far more biting and sarcastic. The candidates were openly contemptuous and disrespectful of each other," he writes, declaring the only winner to be the "grim status quo" of this election. "This was no game changer, and no knockout punches," writes Jim Geraghty at the National Review—except for Trump's refusal to commit to accepting the election results, which could count as a "self-inflicted knockout punch." Caleb Howe at RedState.com declares Clinton and Trump joint winners in their attempts to win over undecided voters: Both know that they are hated by many voters, he notes, and while Trump "appealed [to] the haters who lean right, she appealed to the haters who lean left." Trump desperately needed a win, and for a while it looked like he would get one, writes David Gergen at CNN, where 52% of those polled called Clinton the winner, compared to 39% for Trump. After 40 minutes, Gergen writes, Trump "began to lose steam and, importantly, lose control of his ego. Wild charges, interruptions, defensiveness all resurfaced—some would say his persecution complex kicked in." If it wasn't for refusing to commit to respecting the election results and his crack about Clinton being a "nasty woman," "maybe you could call it a draw," writes Nate Silver at FiveThirtyEight. "The thing is, even a draw would be a bad outcome for Trump, who is 7 points behind Clinton and has few remaining opportunities to catch up." But Trump may not fall further in the polls, "because he's fallen pretty far already and he gave his 35% base some things to be energized about tonight." Ric Anderson at the Las Vegas Sun thinks Clinton came out ahead: Trump was able to, "for the most part, focus on issues and keep his emotions in check," he writes, but his "gloom-and-doom assessment of the economy" will not resonate with voters in Nevada, where the economy has been doing very well for years, while Clinton "stayed the course with her message of creating jobs" in areas including infrastructure improvement. I for one can't wait for this circus of an election to be over, so I don't have to read anymore of Trump supporters comments and crying! Hillary 2016/2017!! ???? Bad hombre is just a line from a bad western, give DT a break... and who gives a crap who hacked the emails? It's their contents we should be talking about!!! Yes she is a NASTY woman! Ask the women Bill groped and were persecuted/pressured/scared to death into silence by her! And why should he accept or concede a vote that hasn't even happened yet? And the way Hillary and the DNC has rigged the primaries and screwed Bernie the whole way I wouldn't doubt how far her tentacles reach in this election! So yes I would be just like Donald and have a wait and see attitude... Don't blame him one iota!